Comments are enabled on WordPress.com blogs by default. You can enable and disable comments. Each blog owner has full control to approve, delete, or edit comments left on their blog. You can allow only registered WordPress.com users to comment, or you can allow anyone to comment. If you allow anyone to comment, you can choose whether the name and email fields are required or not. Your readers can also post comments using their Facebook, Google+, or Twitter accounts. Check out our support page Comment with Facebook, Google+, or Twitter for more information. Makes the name and email address fields required fields. These fields are only shown to someone who is not logged in to WordPress.com. Use this option if you only want to allow comments from people who are logged in. This includes WordPress.com users, and all social network accounts (prevents people from entering their own arbitrary details). There are also settings that control whether a comment is approved automatically or if it must be reviewed before it is published on a blog. See the Settings → Discussion page for more details. 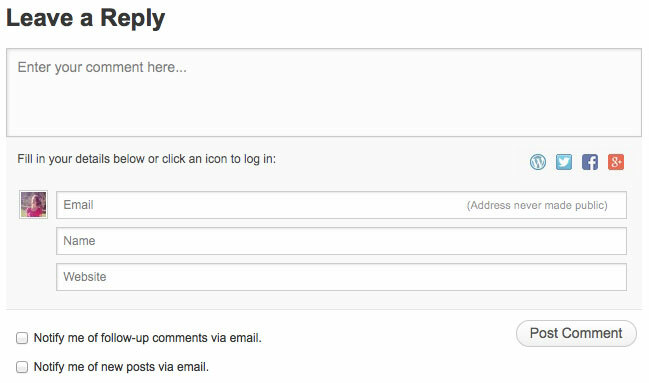 If someone is logged out of WordPress.com, they will see a comment form that includes fields for name, email, and website. They will also have the option to sign in to their WordPress.com account or use an account on one of our supported external social networks.